This new book is a substantially updated and expanded edition based upon the successful and acclaimed Basic Environmental and Engineering Geology by the late Professor Fred Bell. It incorporates the changes that have occurred since and also addresses some aspects of the discipline that have developed a much higher profile over the past few decades. 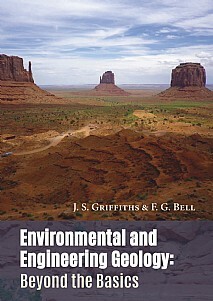 The book is underpinned by two fundamental premises: that environmental and engineering geology represents a single coherent discipline that has a broad remit; and it is a vocational subject and not an academic pursuit, that aims to provide the societal means for safe, economic, and environmentally sustainable planning and development. The early chapters underpin the discipline and deal with: geology and geochemistry; geomorphology; engineering soils and rocks; pedological soils; hydrology and hydrogeology. A thorough appraisal of the various stages of site investigation is followed by nine chapters on the application of environmental and engineering geology. These chapters cover a broad range and draw on case studies taken both from the authors own files and those published elsewhere. In all examples the aim is to illustrate the way case studies have improved our knowledge and developed the science of environmental and engineering geology. The final chapter addresses some of the new issues that environmental and engineering geologists are now facing that were not considered in the first edition, including climate change, renewable energy, geoconservation, geoforensics, and modern military applications. In addition, the requirement for skills that are beyond subject knowledge required by practitioners are introduced, such as project management, health & safety, and seeking professional recognition. An extensive list of additional reading is provided for each of the chapters in the book, allowing readers to explore the rich literature that underpins this fascinating and important subject. This will be of great value to professionals working in the areas of environmental and engineering geology, applied geomorphology and geotechnical engineering; a vital course book for postgraduates and reference for advanced undergraduates in these disciplines.